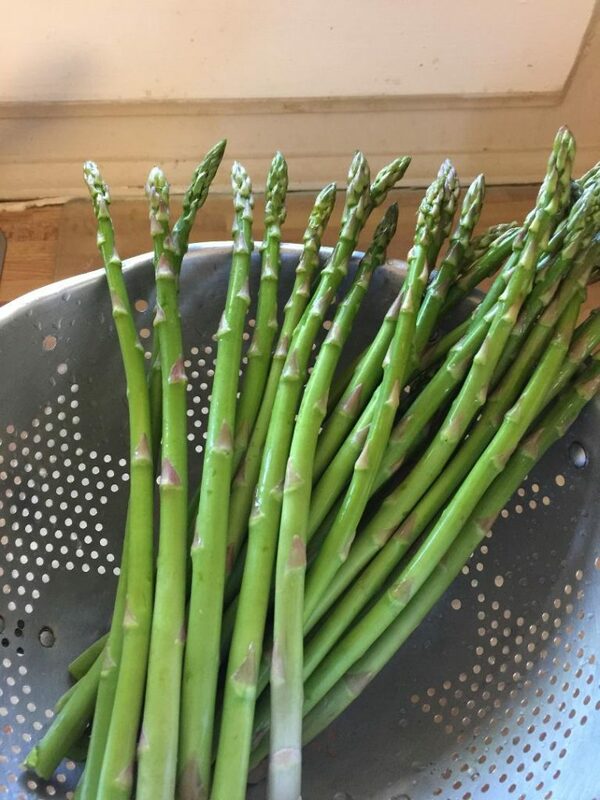 April is peak season for asparagus! Springtime is here and you can always find an abundance of fresh asparagus at you grocery store. There is nothing better, or easier, you can add to your meal than a dish of asparagus. 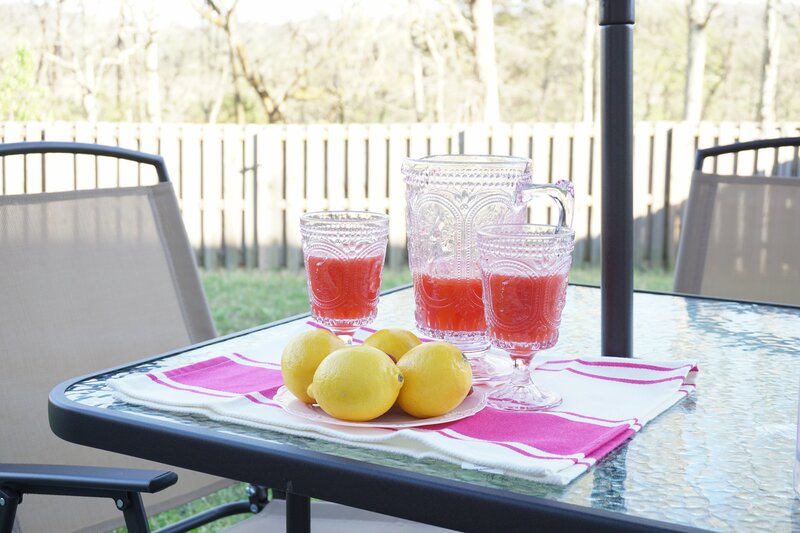 It is so easy to prepare, whether you are baking, grilling, or steaming. This hardy little veggie will become one of your favorite recipes for Easter and other special occasion meals, as well as just a regular middle of the week dinner time meal. 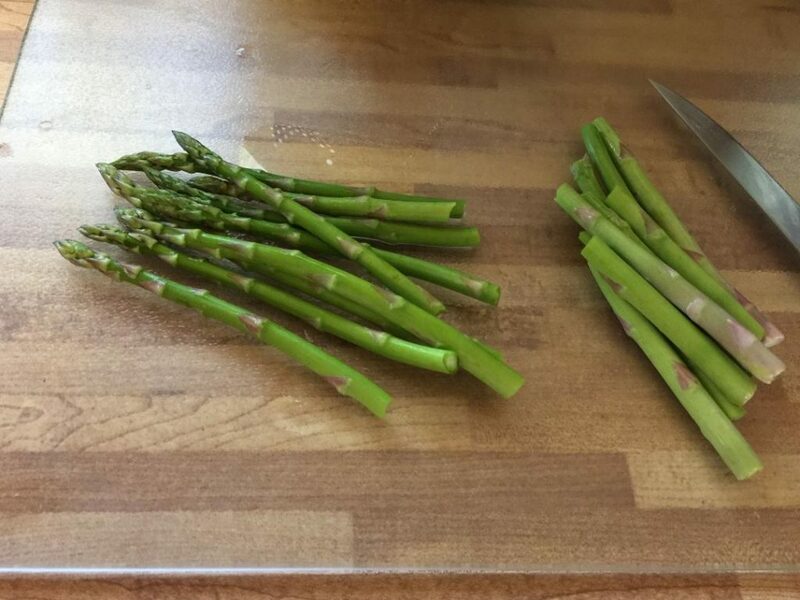 Once you have washed your asparagus, take a bunch in your hands and snap the stems. 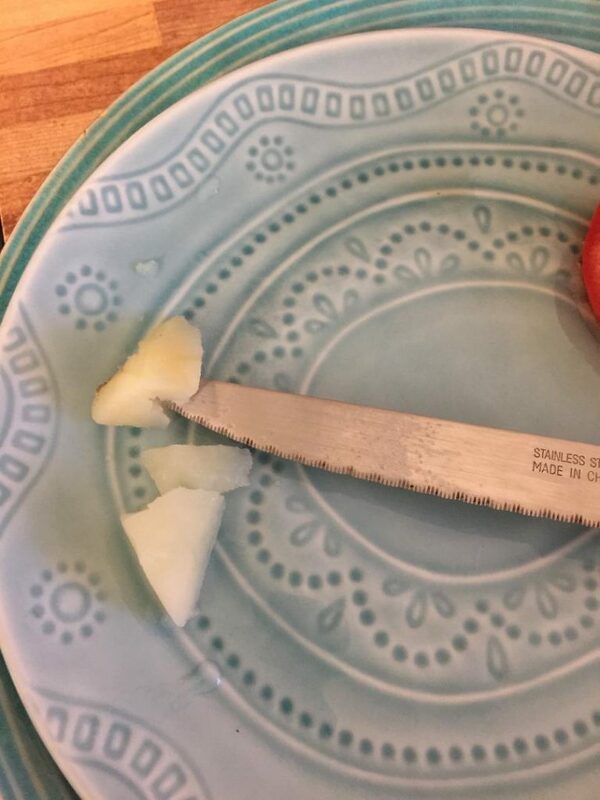 Wherever they snap on the stem, is what you cook. 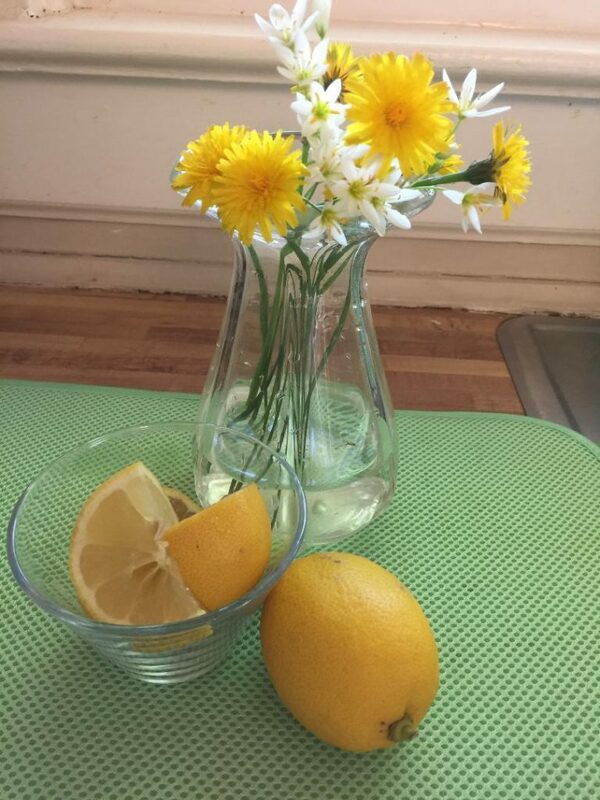 Discard the end of the stems. For this recipe we are steaming the asparagus. 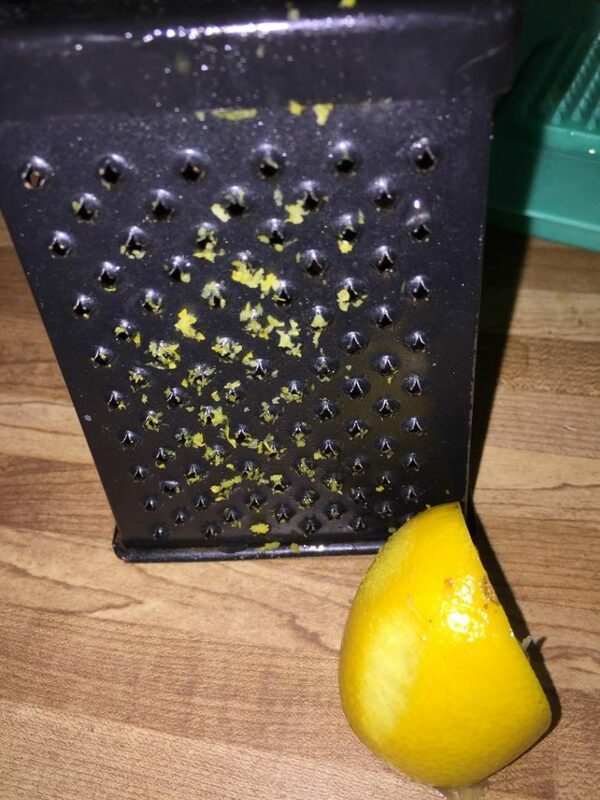 If you don’t have a steamer, you can make your own. Since I couldn’t find mine, I had to improvise, something every cook must learn to do! Take a deep saucepan and fill bottom with water. Over the top of this, add a metal colander. Be sure you haven’t added too much water in your saucepan so it seeps into the colander. You don’t want the water bubbling up into the asparagus as it boils. When the water has come to a boil, cover and reduce heat. Let this simmer for about five minutes. 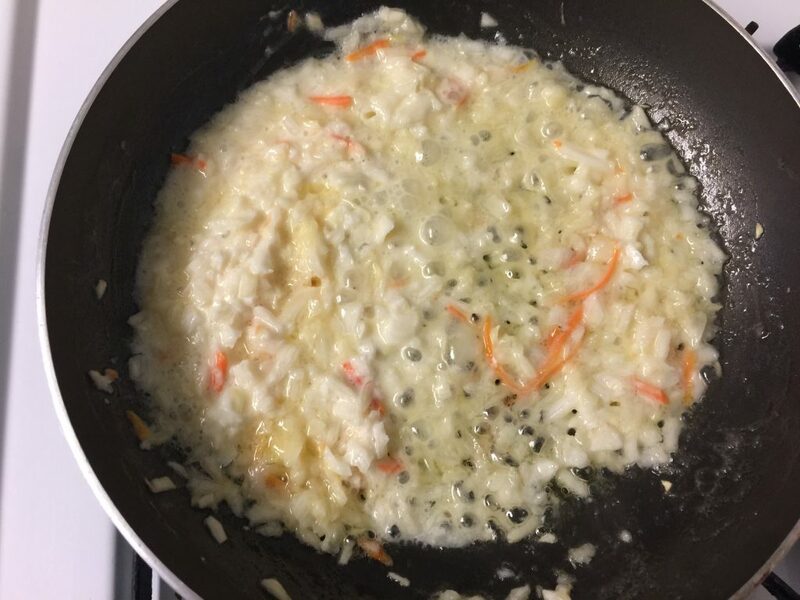 Remove from heat and move on to the cream sauce. 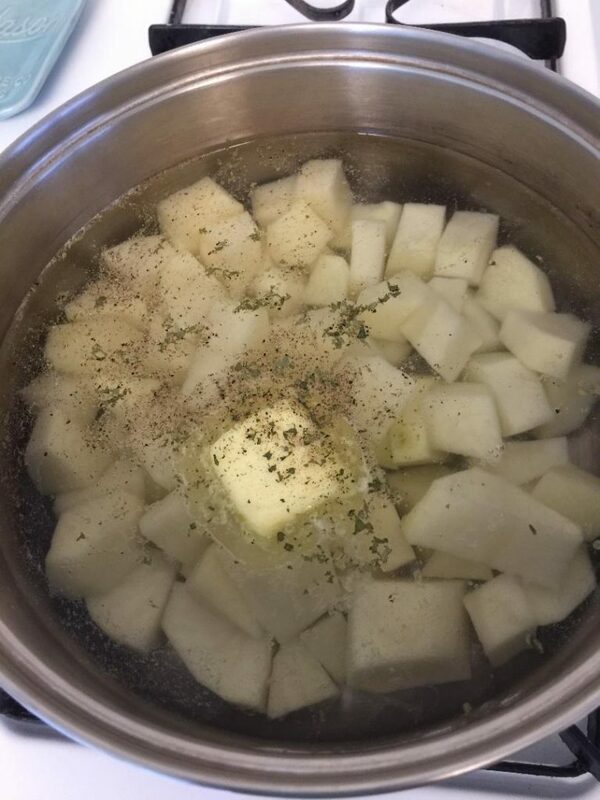 If you have ever made gravy, this is similar. 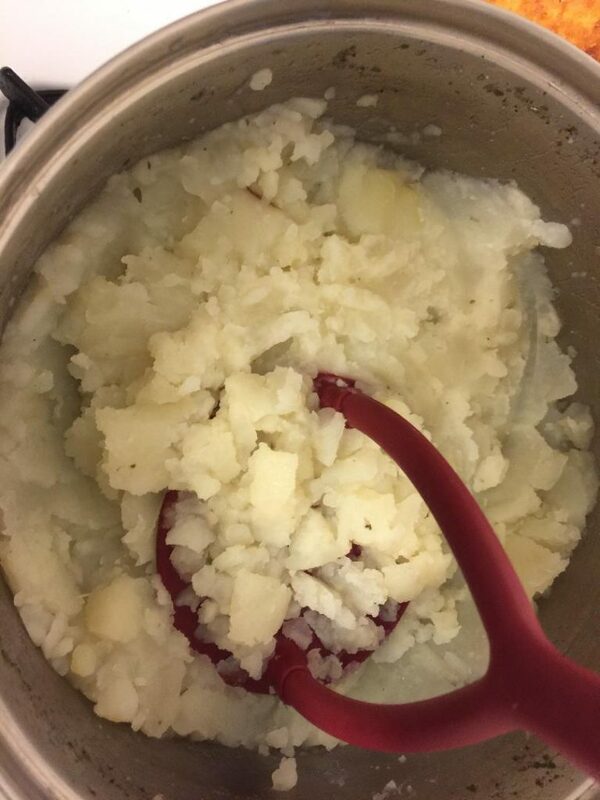 You are making a roux, which is essentially rendering a fat with a flour base and adding a liquid. Here we will melt butter over medium high heat and slowly add in your sifted flour. 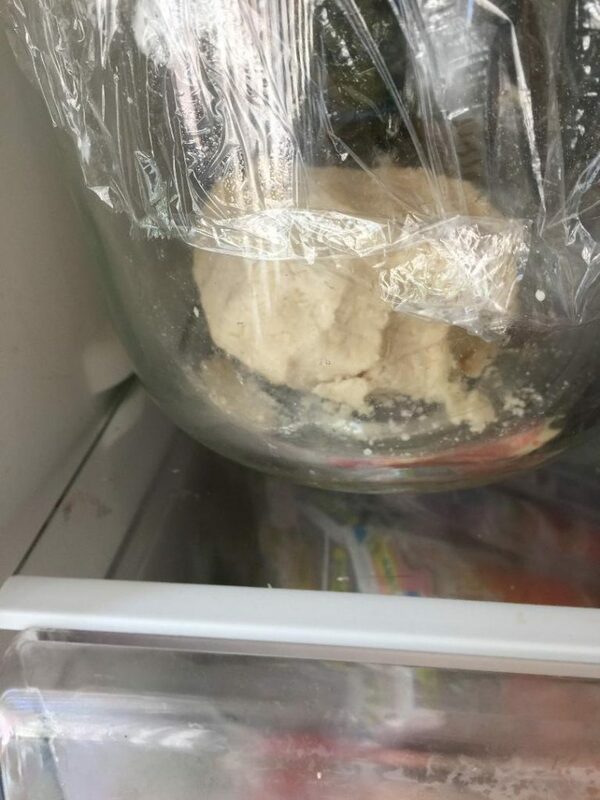 Sift the flour so it will not form in your sauce. 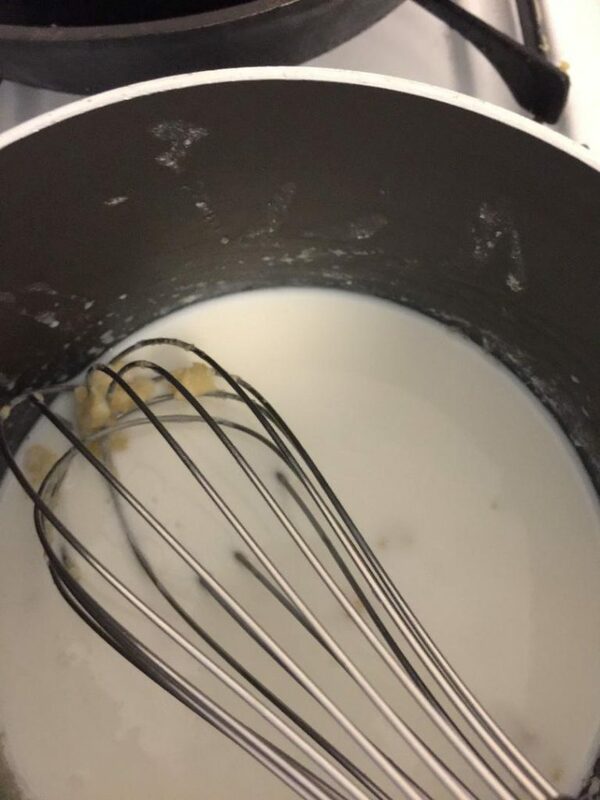 Once the flour and butter are well mixed, add the milk all at once and stir vigorously. Turn the heat down to medium low and continue stirring until the mixture thickens. Once the sauce has thickened, add your wine and dry mustard. Make sure your sauce is now on low heat or it will burn easily. Any time you are dealing with milk, it tends to burn very quickly. Now you can remove from heat and add the cheese. 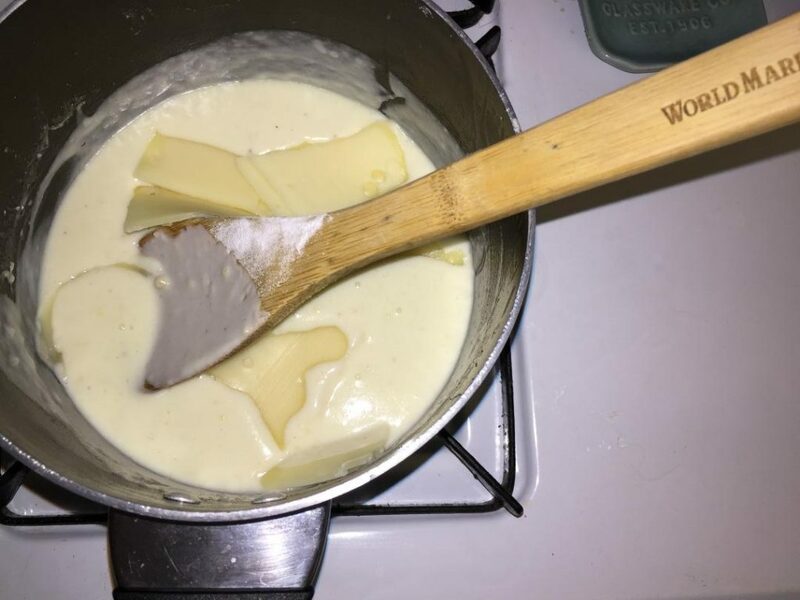 Stir as you add in the cheese and it will melt as soon as it is poured in. I am using swiss for it’s extra pungency but you may add your favorite instead. 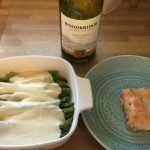 Arrange your asparagus in your serving dish and pour your sauce over it. 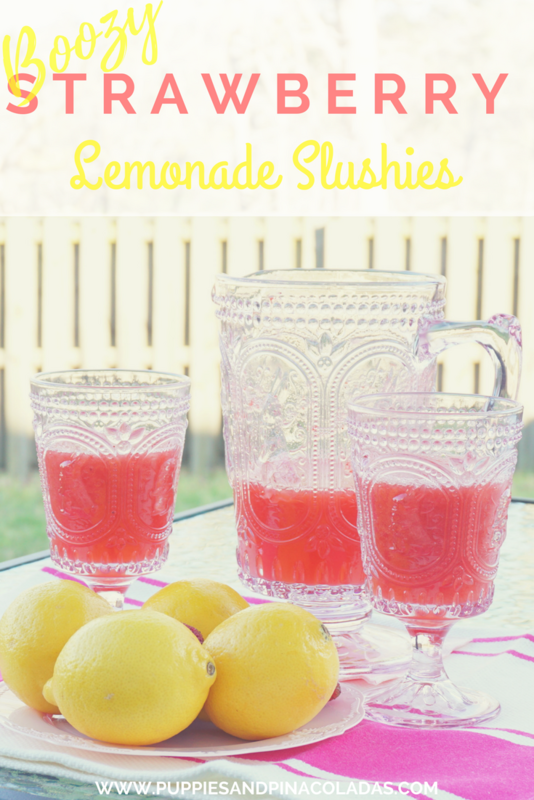 I’m sure you will be making this one more than once this spring. 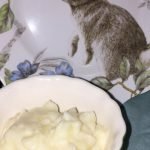 And it really is a quick and easy side dish to make. I have paired this dish with a nice baked salmon. Asparagus will also go well with ham. 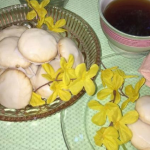 You will find it is a light vegetable as well as versatile. Add the white wine and your meal is complete! 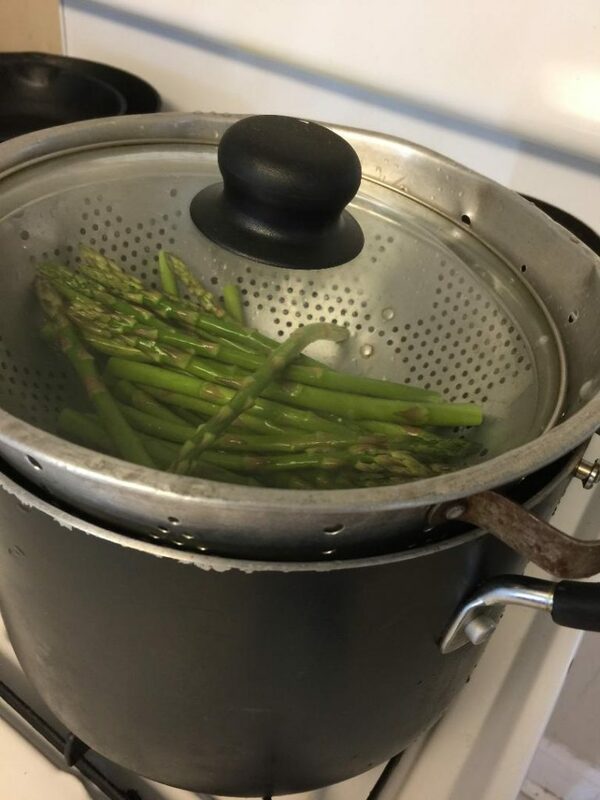 Place asparagus in steamer and steam for 5 minutes. Set aside. For Sauce, melt butter in saucepan over medium high heat. 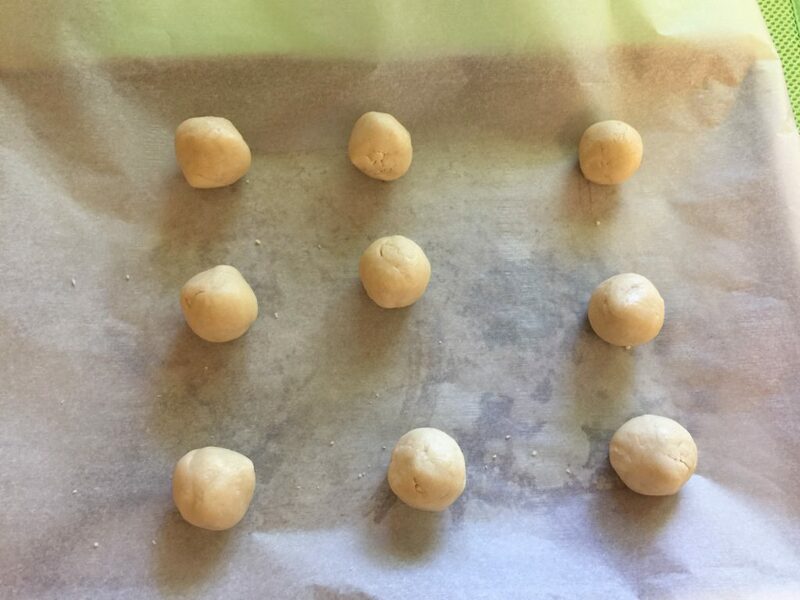 Slowly add in flour and mix until there are no lumps. 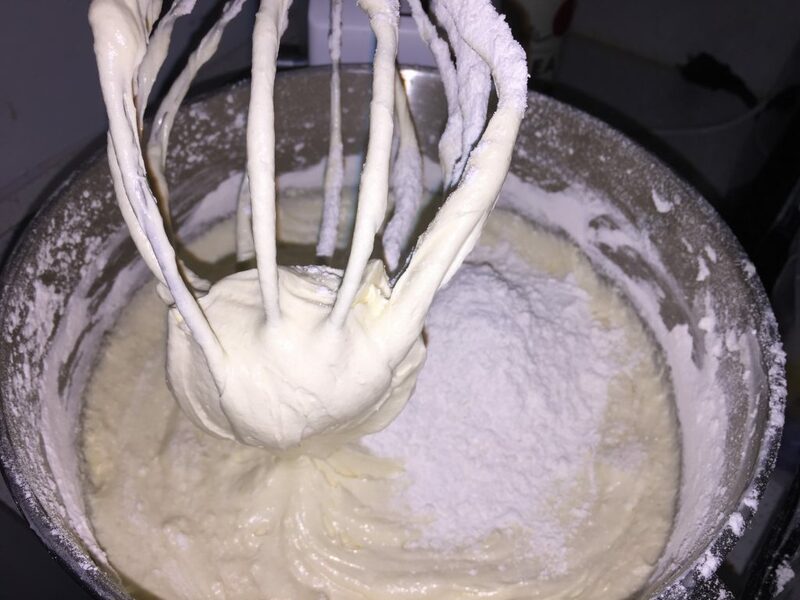 Add milk to flour mixture and whisk until combined. Add in wine and dry mustard and continue stirring. 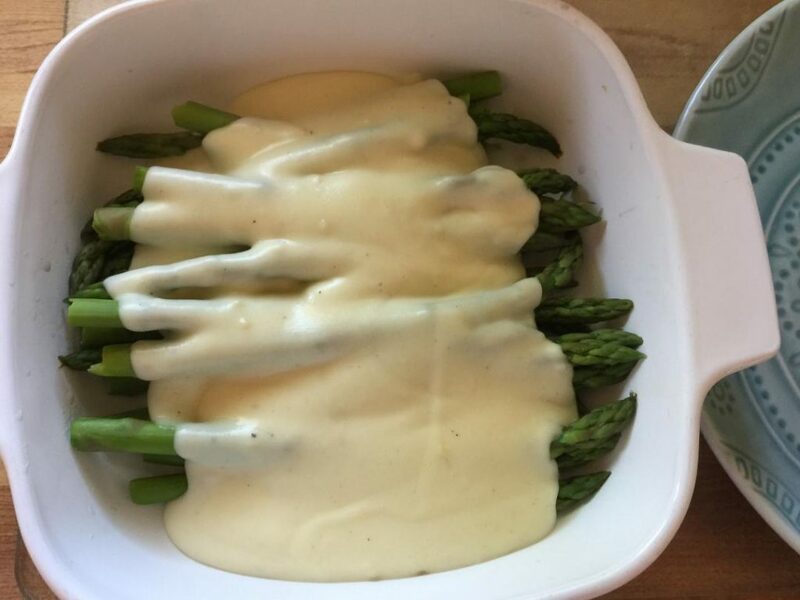 Place asparagus in serving dish and top with cream sauce. Wedding season is almost here – time for Almond Cupcakes! 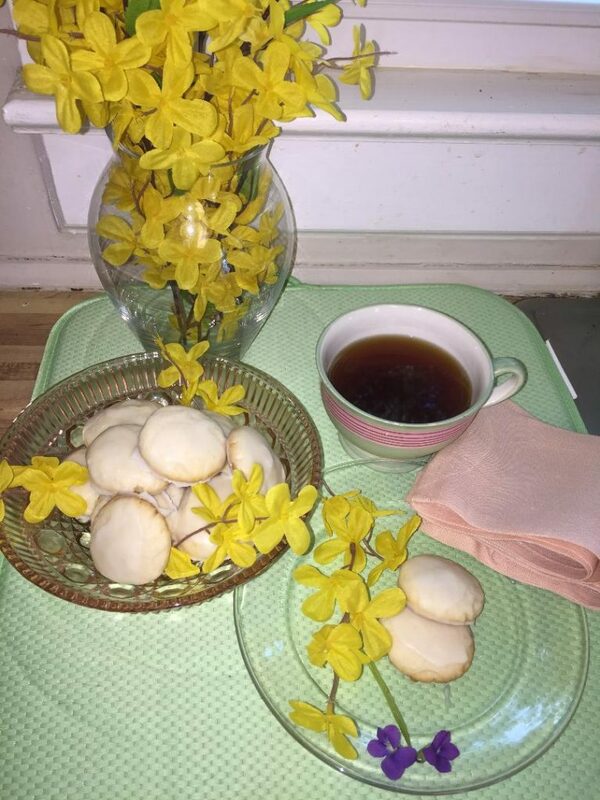 The first day of May was yesterday and it reminded me of the May Day celebrations my mother used to have for her kindergartners in the early 70’s. 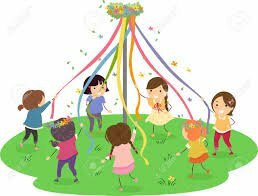 She would string colorful ribbons down from a short pole in the playground and, weather permitting, the kids would go outside and dance barefoot around the maypole, ribbons in hand. I can still hear the laughter and the joy from those little ones. I don’t know what made them happier, the fact that they were going barefoot outside for the first time of the year or that there was going to be cupcakes afterwards! 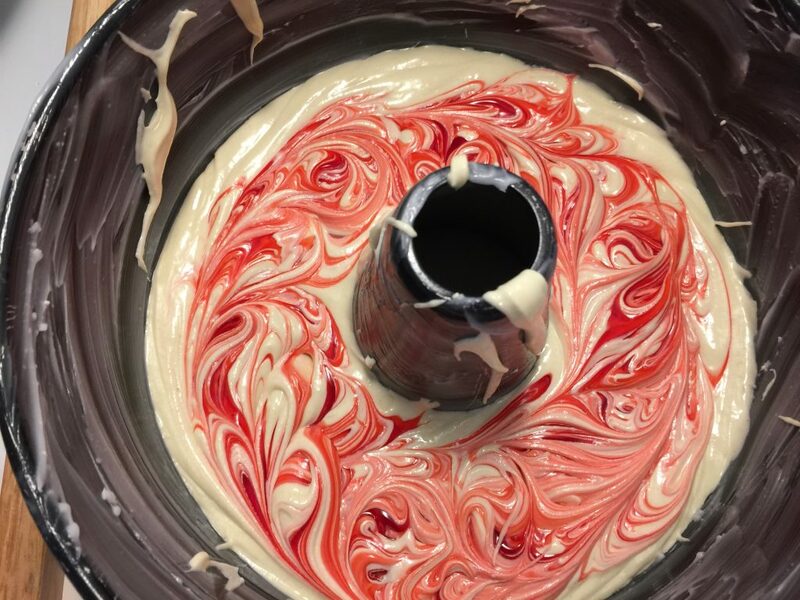 Today I am making the most delicious cupcakes with a wedding cake worthy icing, I am cheating on the cupcakes by using a mix. But I am trying something new that I have always wanted to do. I have heard about adding in extras to the box mix to make it taste more like a scratch cake. 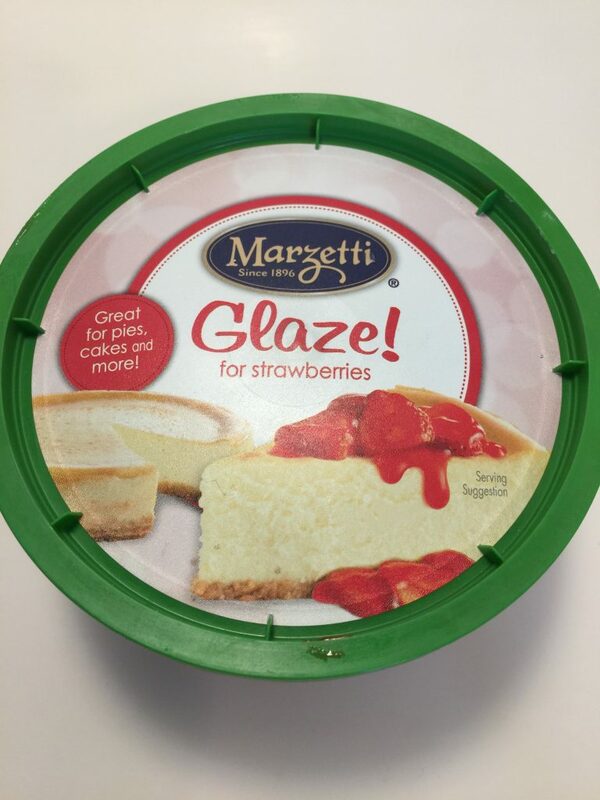 Since all I make are scratch cakes I was very skeptical. I must say these are pretty close to the real thing. 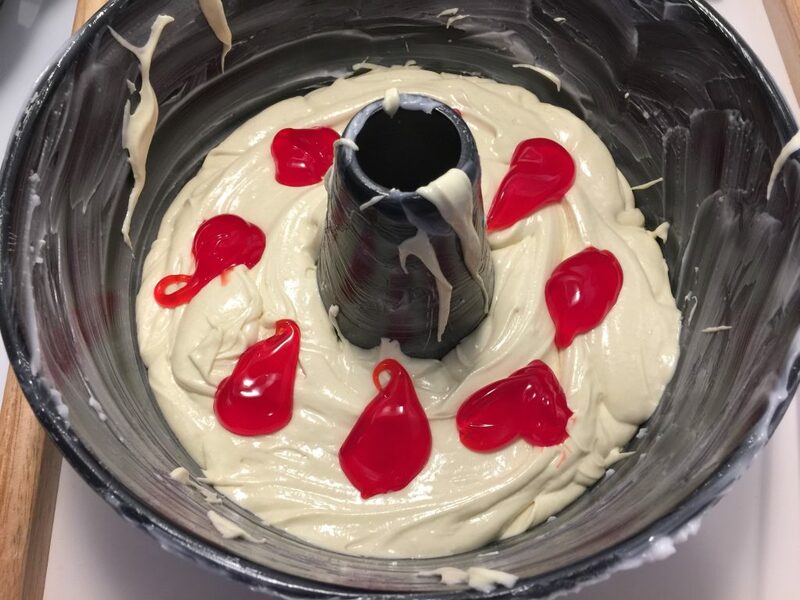 First, you will want to mix up the cupcakes. Go ahead preheat your oven to 350°. 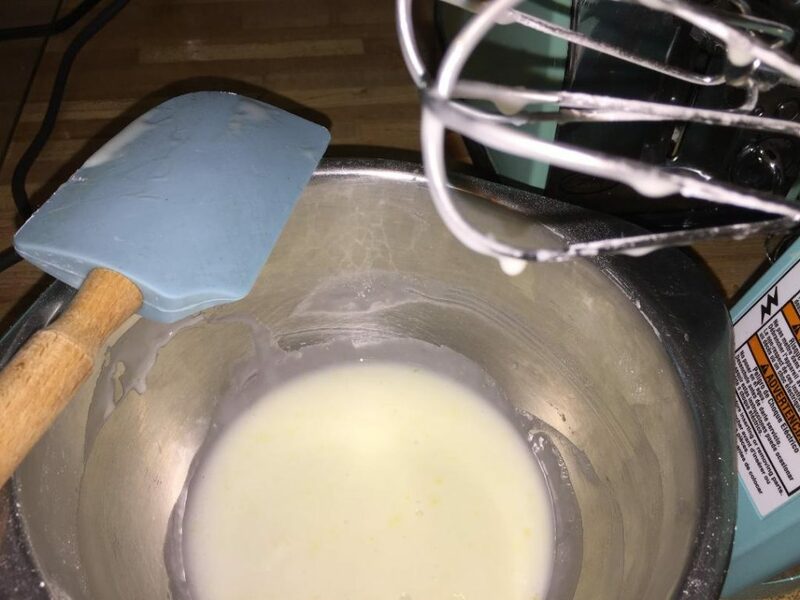 Mix your cake mix, butter and eggs until all are incorporated. Then add the milk in increments until everything is mixed together. Continue mixing for another 3 minutes. 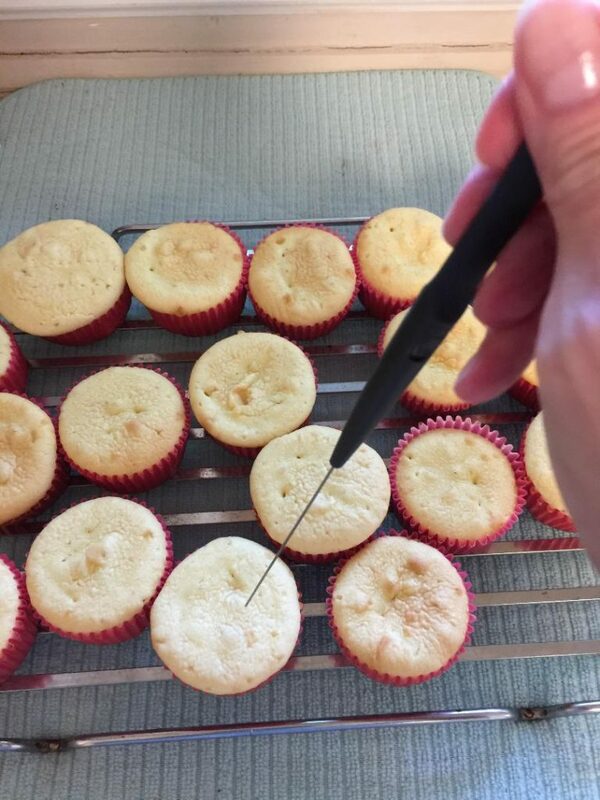 Fill the cups 2/3 full and bake approximately 15 minutes or until your cake tester comes out clean. Once they are done, set out on a wire rack to cool. It is a little labor intensive but so worth the effort. 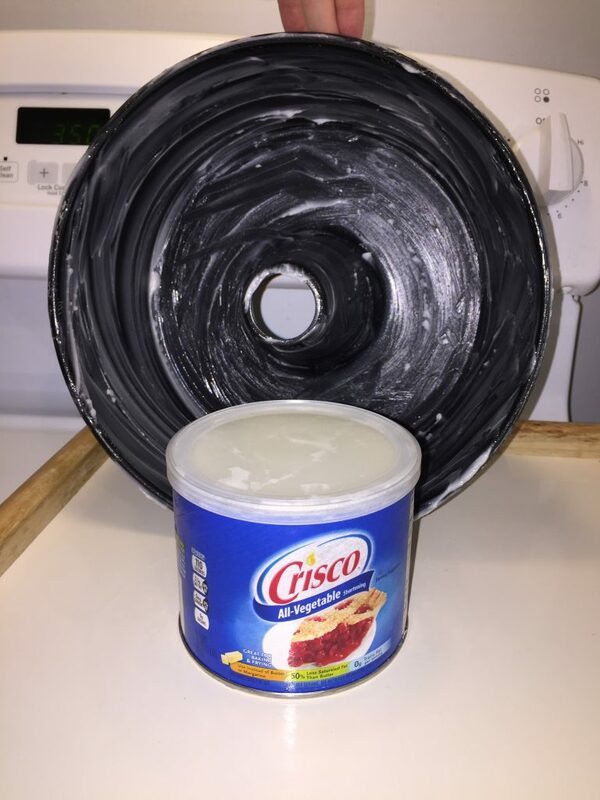 I must say I have never done icing like this but I conquered it and I know you will too. First, sift your flour into a small saucepan that has your milk already added. 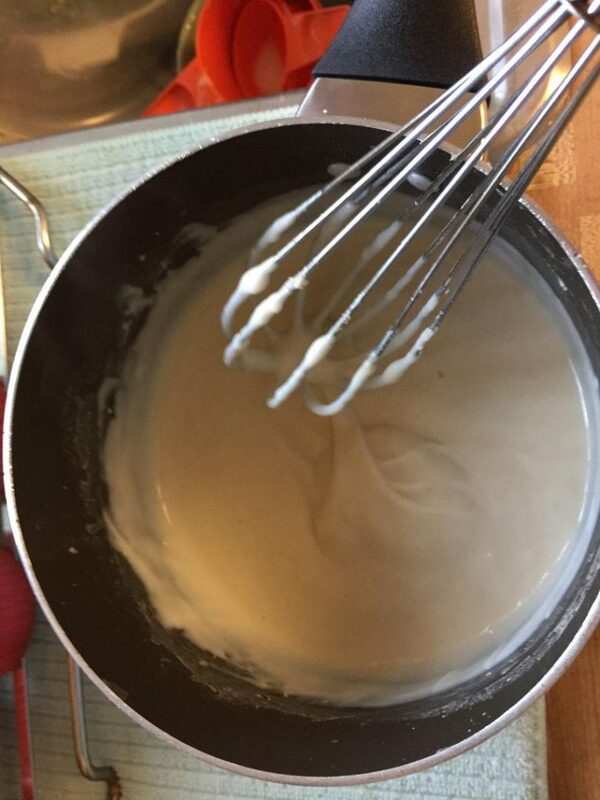 Over medium heat, start whisking the mixture continuously until it begins to thicken. You may need to turn heat down to low. You don’t want this to burn to the bottom of your pan. This process takes about 15 minutes so be patient. Keep stirring until it is almost too thick to stir. Remove pan from heat and place ban on a bowl of ice to quicken cooling. 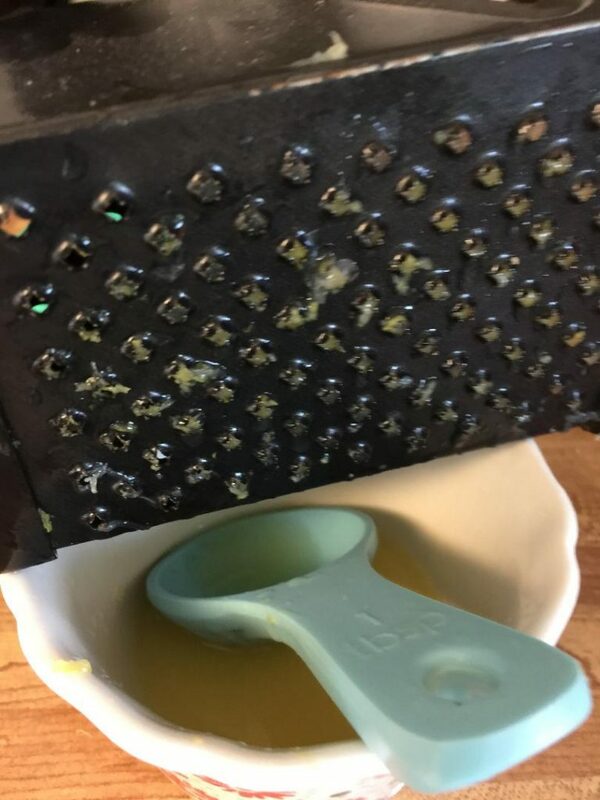 While that is cooling, you can begin creaming your sugar and butter. 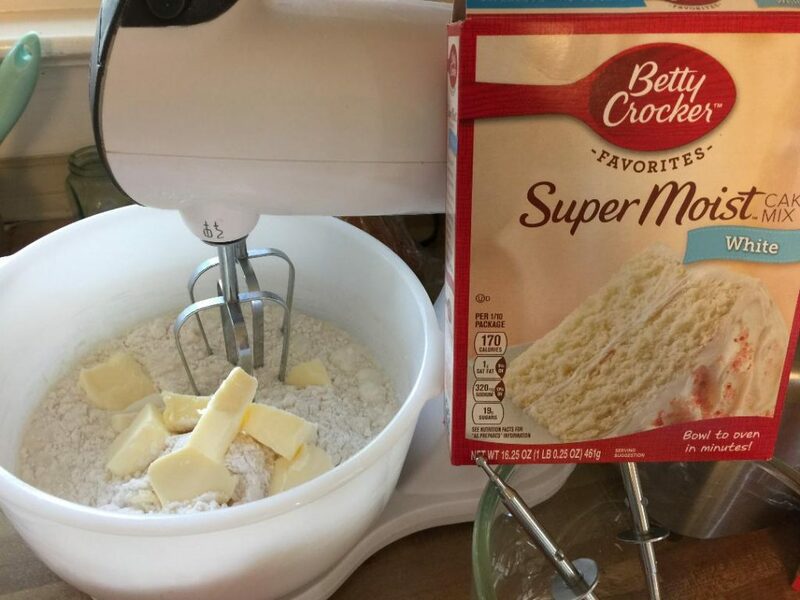 Place your softened butter in your mixing bowl. Put your sugar into a food processor or bullet until the sugar is fine. Add the sugar to the butter and mix until it is almost white. Add the extracts. Once the flour mixture has cooled, add to the sugar mixture. 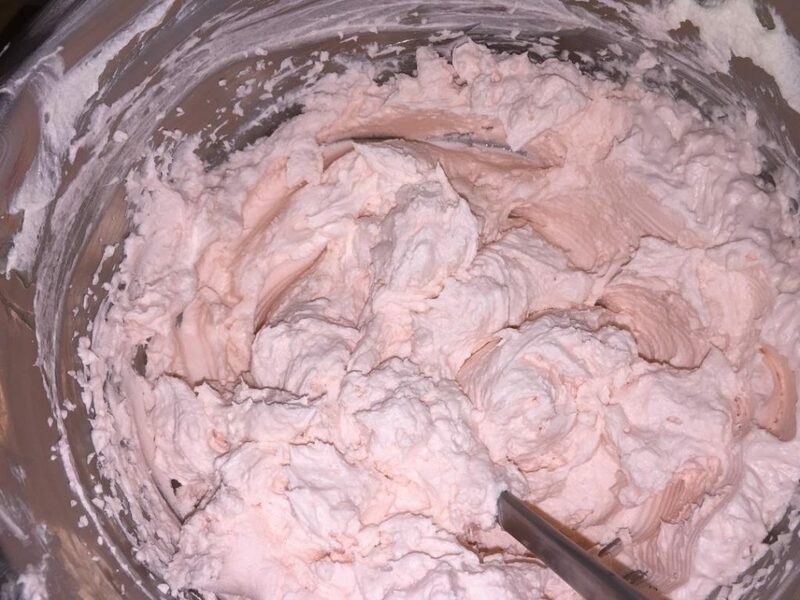 Continue mixing until you have the consistency of whipped cream. I wanted pink so I added 4 drops. 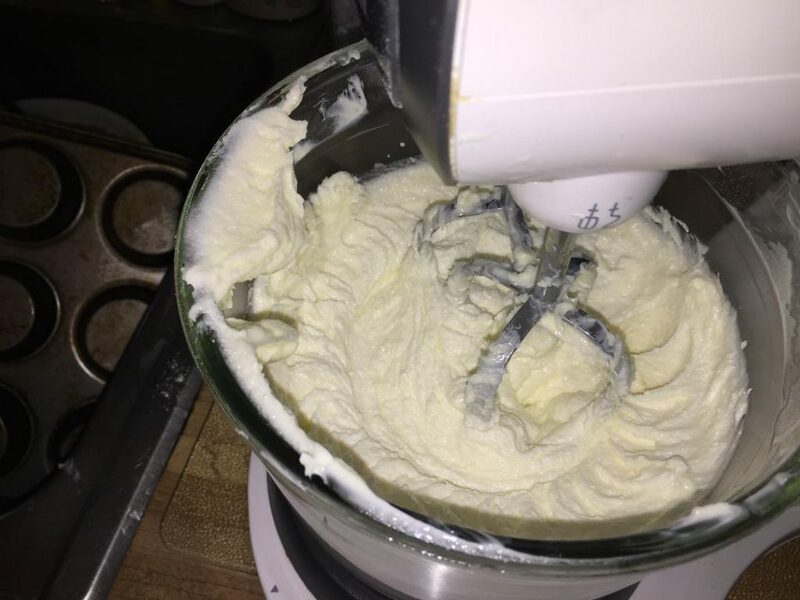 After you have done this, give the mixture another minute of mixing and then you may begin frosting your cupcakes. 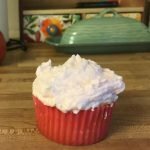 The thing I liked about this icing recipe is, though it looks like whipped cream, the consistency holds up a little better than that. It was so decadent, I was heavy on the icing. It is the best part, right? Although, the box mix cheat wasn’t half bad either. The structure was light but not as hollow as you get with a box mix. I was very pleased. 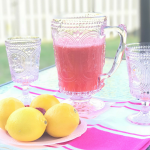 The pink color looks delightful and would be perfect for a little girl’s tea party or a garden club meeting. This was part of our picnic series but before I could get outside with them, they were all eaten up! 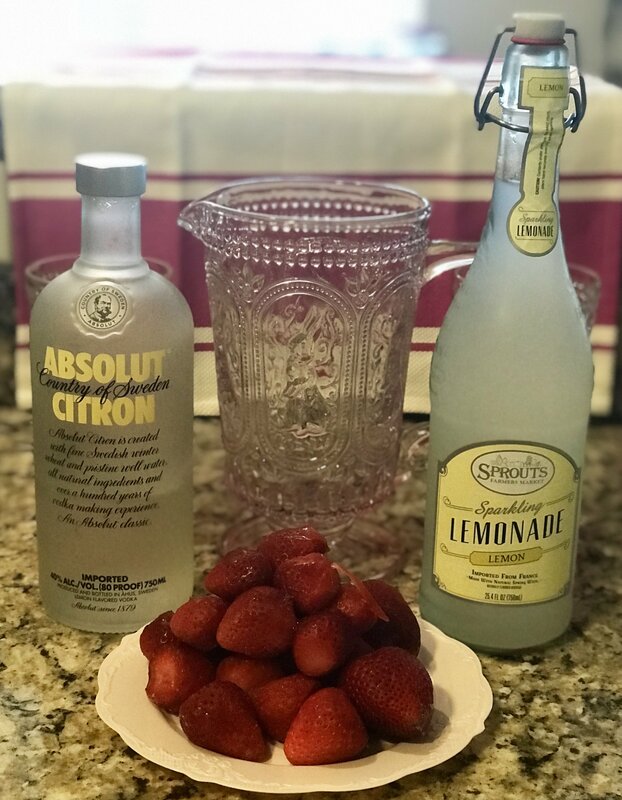 So if that tells you anything, this is a recipe your kids will enjoy as well as the grownups. Cupcakes are great desserts on the run because they are easy to serve and they always bring a smile to everyone’s face no matter if you are a 5 year old or a 95 year old! These almond cupcakes are perfect for wedding showers & more! 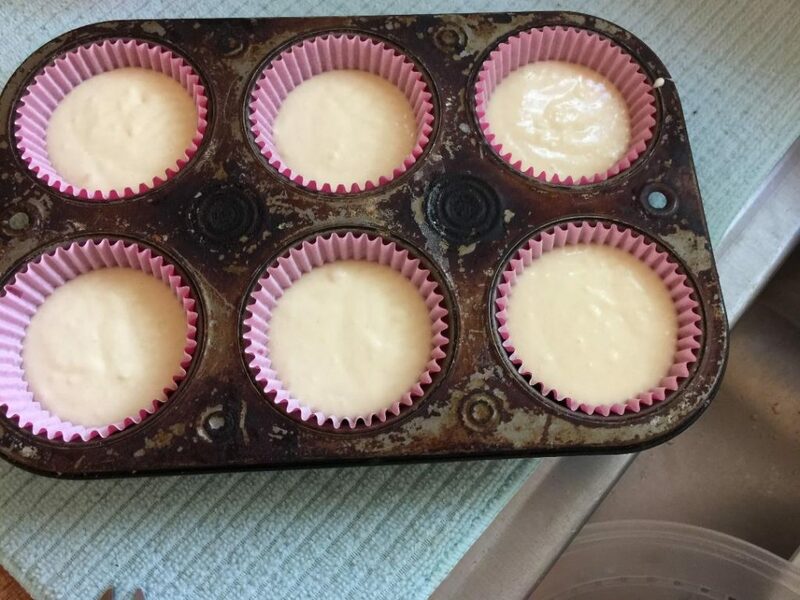 Line your cupcake pans with cupcake liners. 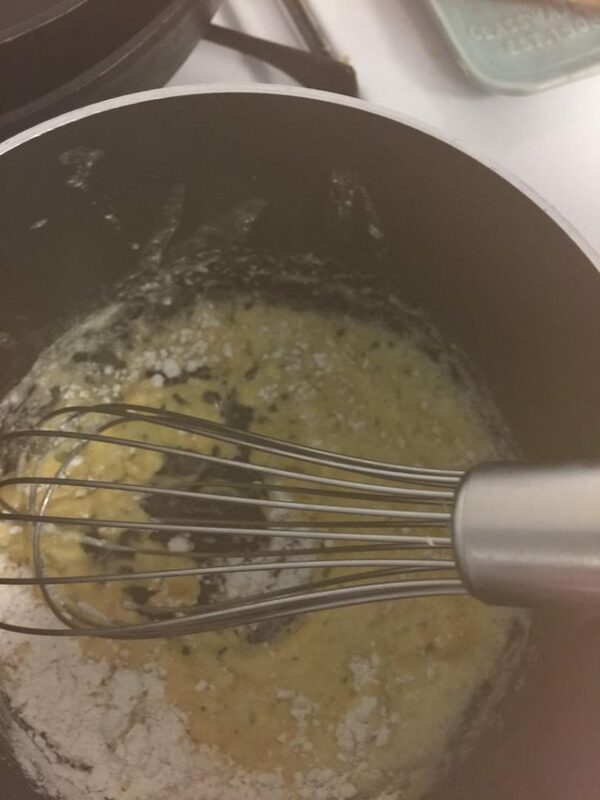 Mix cake mix, eggs and butter until well blended then add in milk in increments mixing well. Fill your liners with the mix til the cups are 2/3 full. 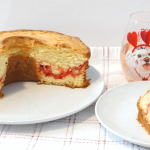 Bake for approximately 15 minutes or until cake tester comes out clean. 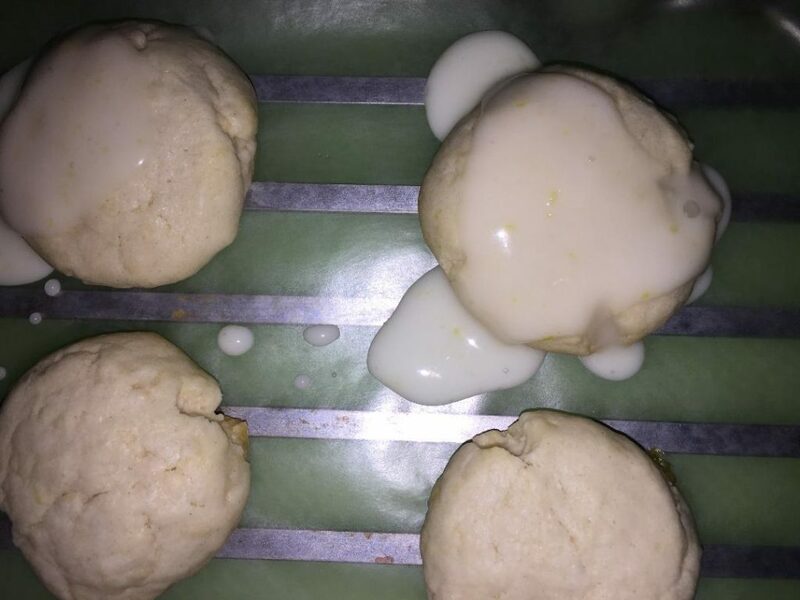 Let cool for 10 minutes before icing. 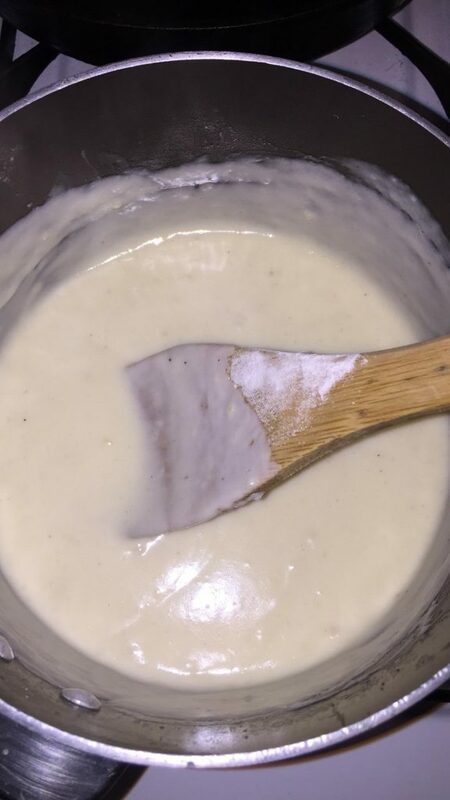 Sift flour and whisk into the milk in small saucepan over medium heat. Continuously stir mixture until it thickens, lowering the heat if necessary. You don't want it to burn to the bottom of the pan. Mixture is ready when it is too thick almost to stir. This should take about 15 minutes. Remove pan from heat and place pan in a bowl of ice water. This will speed up the cooling. While the flour mixture is cooling, begin creaming the butter and sugar. 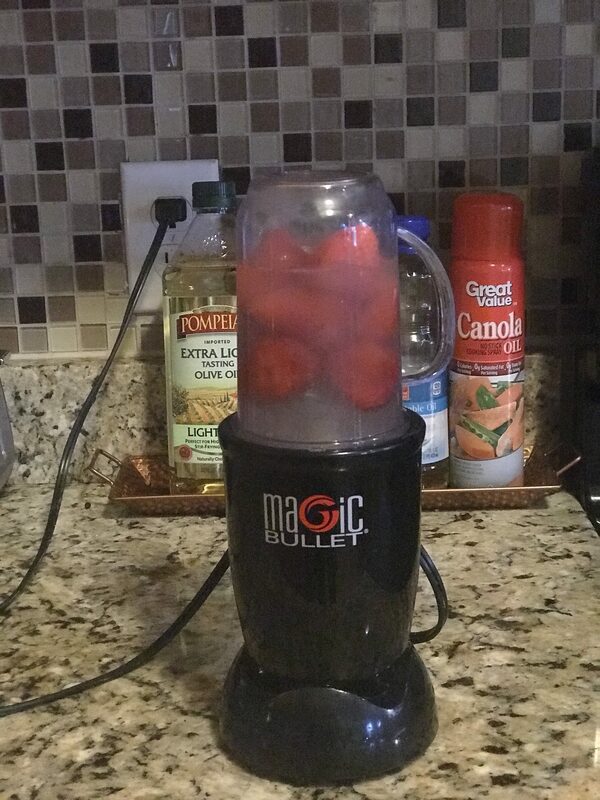 Process the sugar in a food processor or ninja bullet. Do this until the sugar is really fine. 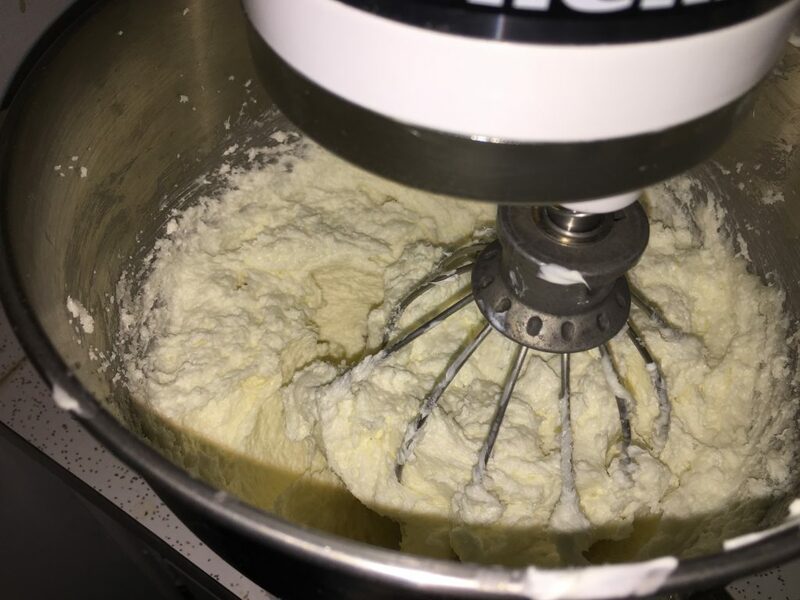 Cream together the butter and sugar until the mixture is almost white. 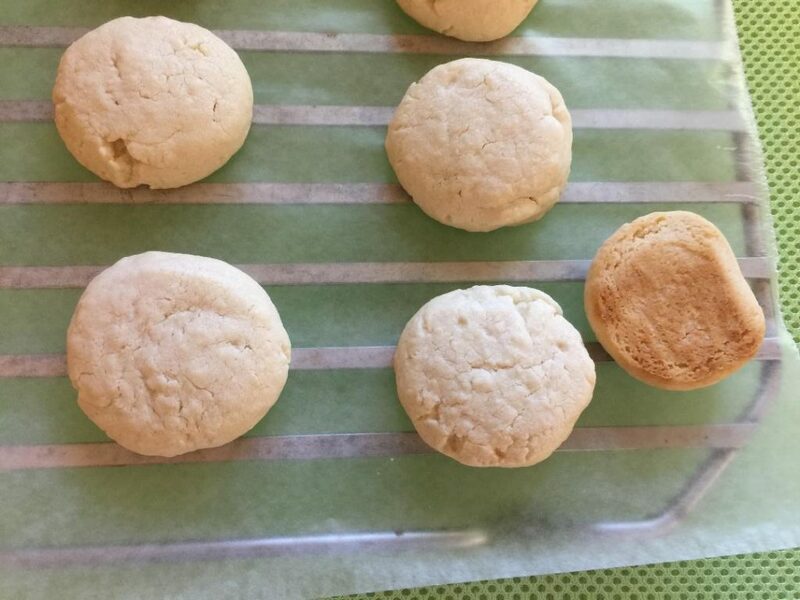 Test to see if the flour mixture has cooled. Add the extracts to the sugar mixture and blend well. Add the extracts mixing well. Keep mixing well, scraping the sides of bowl making sure it all gets mixed. If you want a color, you may add now. 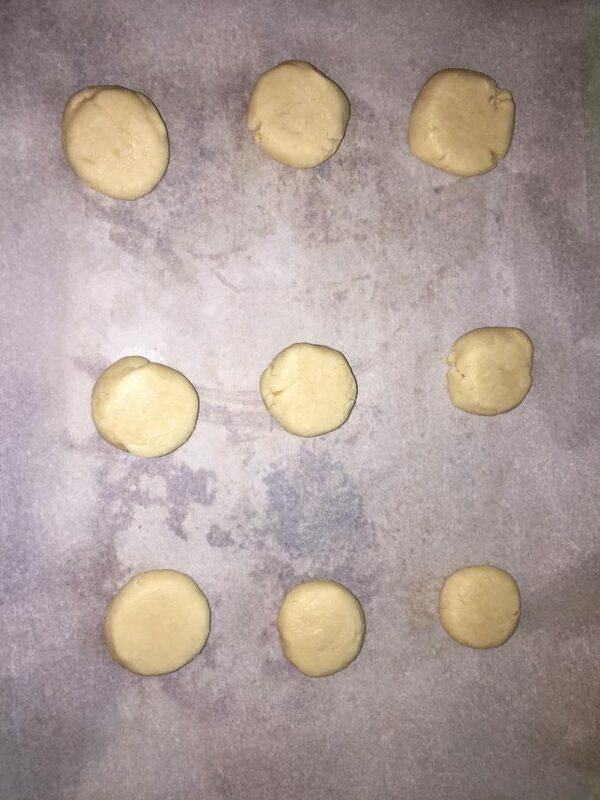 The consistency looks like whipped cream when done. Once cupcakes are cooled, you may add the icing.